Delayed Viewings, or in some parts called Delayed Live Viewings, are limited-time screenings of recorded live events at select theaters. These (strictly in the context of Japanese media at least) are typically of the concert nature, and tend to feature idols or idol-like personalities such as singers and voice actors. “Delayed” here is to differentiate from what the industry calls “Live Viewings”, which are the events themselves streamed live across the nation (read: Japan), to serve as an alternative for fans who couldn’t be in attendance at the actual location of the event (either for geographical restrictions, or for the fact that tickets for a majority of these are lottery-based, and that one can only get from buying CDs/DVDs of the performers). As it would be very impractical (and just plain hard given the time lag) to live-stream these events overseas, fans outside of Japan would get the next best thing in the recordings of streams used for the Live Viewings — hence Delayed Live Viewing. In recent years, DVs/DLVs of Love Live! events in particular have come to prevalence following the franchise’s continued success, which saw (and continues to see) to multiple screenings worldwide of their major live events. So, Carriage, for what event was the first DV you went to? My first DV experience was Aqours’ First Live. My friends and I had gotten into Love Live! the previous summer when Sunshine!! aired and so when we heard that we were going to have the chance to watch Aqours’ first live event, even if delayed, we jumped at the chance! I had some reservations about it since it would be the first time that I’d be at an event with other LL! fans, but I ended up having a blast. Ohh, nice! For me, my first DV was for μ’s Final Live, ironically enough (xD) One of my good uni friends who got into the franchise early on invited me to go with them. I was only really a casual fan at the time, having not even watched the anime in full, and with most of my LL! knowledge coming from said friend. It was towards the end of a pretty hectic semester on my end so I thought “I need a breather” and said I’d go, despite essentially not knowing anything about how it was gonna go down, haha! Oh wow, that’s definitely one heck of a first DV experience! Emotions must have been running high in the theatre that night, huh. Now I’m super curious, what did you think coming out of that live? The experience made me a fan of it, franchise and all — would be a nice summation of my overall takeaway from the live. It was such a surreal feeling. I knew it was essentially a recording of a concert coming in so I thought we’d just be kicking back and watching a show. In those 4 or so hours I was just taken it by that world. It was strange in that, at times I really did feel like I was there watching them too, as odd as that may sound. Coming out of it I was just filled with the utmost respect for those nine girls that really just poured their all on that stage. Ah yeah, that’s a great way of putting it and I totally get the feeling. From the outside perspective, it does seem weird that so many people get together to get excited about recording of an event that already happened, and I do still get a little bit of that feeling at the start of every DV. But at some point it all melts away and like you said, it feels almost like we’re suddenly right there, being a part of the “live” in the truest sense of the word, Haha! That said, for that specific DV, I/we did end up sitting through it for the whole thing (xD). DVs were such a foreign idea (I was at a theater in the Philippines at the time) so it wasn’t a packed place for one, and as much as I wanted to stand to really get into that concert vibe, it would’ve been weird if it was just me and my friend doing it (lol). We did pick up lightsticks from the local bookstore to use during the live though, Haha! Was the place full at your theater at all? How’dya end up getting into it yourself? It’s a little frustrating to say now but I ended doing the same and sitting down and listening the whole time. Although in my case, there wasn’t really any good reason not to join in on the fun; our theatre was packed with excited fans who were very ready for the occasion. I think I was just a little intimidated by it all and being light-stick-less certainly didn’t help either, Haha! It’s crazy how much of a difference having this one little thing makes on the experience! By the by, what other DVs have you went to since Carriage? It’s the same for me, Haha! Since that first live, I’ve been lucky enough to be able to go to all of Aqours’ DVs – so in total that’d be the 1st Live, the 2nd Live, the Hakodate mini-live, and the 3rd Live, which I went to see this last Thursday. How about you? I’m not aware of any DVs for non-love live related groups but have you gone to any of those? Ah I see! I guess we’re both about equally experienced with DVs then. So on that note, and I’m not sure if you’ve already indirectly answered this or not but, what exactly keeps you coming back to these kinds of viewings? It has to be the atmosphere for me. Going back to what I said earlier about that surreal feeling that I got, I feel as if I experienced that two, maybe three-fold, when I went and saw 2nd Live. This time the theater was full from end to end (albeit it was a smaller one than when I saw Final Live) and everyone was on their feet for pretty much the entire live. 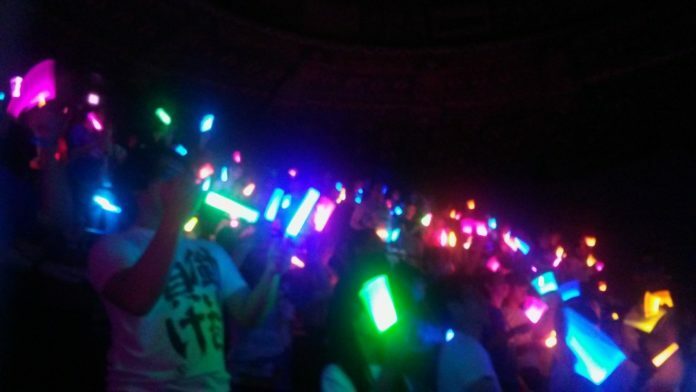 Shouting calls and waving lightsticks in the air; it was really fun being part of it all. So if anything, you could say I go to DVs for that — of course I want to see the actual performances too (xD) but, I’f be lying if I said I didn’t look forward to getting all hyped up in a room full of fellow fans, Haha! How about you Carriage? It’s pretty much the same for me! It’s definitely not something unique to DVs, since I’d imagine it’d be about the same at actual live events, but there’s a kind of solidarity of passion and emotion that come from being in crowds like these that makes DVs so fun to be a part of. Aside from that though, I’ve also been able to meet up and hang out with a couple Twitter friends in person at DVs so they’ve been events that were even more special to me because of that. Ohh! 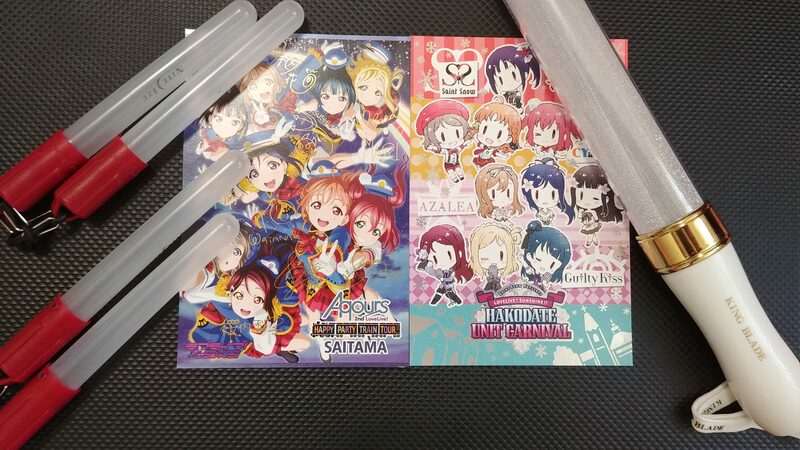 Can’t say I’ve had the pleasure of meeting up with mutuals for these (not by choice, I’m just shy even on Twitter, lol) and because I actually had to move in the time between μ’s Final Live and Aqours 2nd live, I didn’t have my friend with me to go with, so really I’ve been going to these DVs pretty much alone. Which was surprisingly alright too, even if I did have my reservations going to a thing where I basically knew no one (for those of you reading this and are curious about attending something like this but can’t get anyone to go with ’em, lol). You bring up something interesting though in saying that it’d be more or less the same as attending an actual live event, and while “live” can be a matter of perspective, for semantics sake we do know that this isn’t a live event and — as per its namesake — is a Delayed Viewing of what was a live event. Ah, it’s too bad that we don’t live close together ’cause I’d love to be able to hang out at a live with you! And I do agree, going solo to DVs is perfectly fine too. More often than not, the people there are pretty welcoming and there’s certainly enough like-minded fans there to talk to and possibly even befriend, Haha! And that’s right, it’s a recording of a past event but it often doesn’t really feel like one when the lights in the theatre dim and the show begins. That being said though, there are a number of things that come with it being a delayed viewing that does factor into the experience of the viewing itself. For me in particular, knowing the set-list ahead of time does take a little away from the excitement of not knowing which song may come next. How do you feel about the whole “delayed” part of the viewings? Same~! (>///<) And, oooh, I have a story sort-of related to that so remind me later (xD) I’m of two minds about it being “delayed”. The biggest thing is, as you said, learning about things in advance — almost like getting spoilers for a show since LL! Twitter is just a trove of post-live reports just hours removed from an event. For the most part I try to go in to the DVs blind, at least for stuff like set-lists and what the girls do on stage (like if they do a move or something) to preserve a bit of shock value as with you. Now, I wouldn’t call it a “pro” of it being delayed, but I do like getting to know about stuff that happens in MCs or talking segments ahead of the actual live. It helps me prepare contextually so I can follow along with what’s being said. Haha, I’ll hold you to it then! And that makes a whole lot of sense. As a still-beginner-level Japanese learner myself, the MC’s and in-between sections are usually… hopelessly indecipherable, so some extra context for them would definitely help! That brings up an interesting topic though in regards to these DVs which are becoming less and less “delayed” now. There’s certainly not enough time to get subtitles or anything of the sort on for these viewings so they are, generally, entirely in Japanese. How much do you figure that affects the experience of the show? Good question. I think I’ve had an interesting case study on that when I compare my level of Japanese comprehension from when I went and saw Final Live to when 2nd Live came around (which had a good 2 years of on and off study in between ’em). Oh that’s really cool actually, being able to see your proficiency progress through the lives and I completely agree. Just watching the girls goof around during their calls or MC is usually fun enough even without knowing all the context behind it so I don’t think that understanding it all is mandatory. That being said though, there was a part in the third live DV where the lyrics for a couple songs came up in Japanese and the audience was invited to sing along, and I feel like that would have been so much better had we all been able to at least read Japanese, Haha! I actually surprised myself with that part with how much kanji I recognized, Haha! It also helps though they sometimes go through the motions in saying stuff that they usually say elsewhere. Whether it’s the generic “let’s all get fired up and have fun~!” to the calls and responses that I think are easy enough to recognize. With songs too even if you can’t read the lyrics off the screen, you can sing along still if you “know” the words to it, which I know some fans actually do. In line with that, I’d like to know Carriage, how much in the way of preparing did you do for the DVs that you went to? Personally I don’t do a whole lot of preparation for DVs other than maybe listening to a couple songs again to refresh myself on the lyrics but I know that preparation is a pretty huge thing for a lot of other fans. Whether that be dressing for the occasion in support of your favorite girl or bringing as many light sticks as humanly possible, getting ready for the event is a pretty big thing, Haha! How about yourself Leap? I take quick looks at the call books released by Team ONIBE a couple of days before the DVs just in case the people in the theater know ’em too so I can cheer along; especially with song calls which are really fun to do as part of a crowd. I’ve yet to wear anything LL! 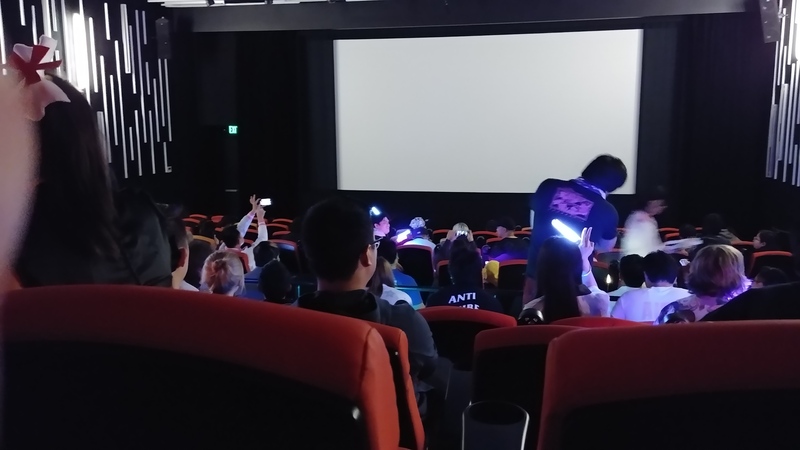 related to the DVs though (which made me stand out like a sore thumb at the ones I wen toxD) but I do make it a point to at least bring lightsticks with me. Going back to what you said earlier Carriage, these little things make all the difference with not only participating, but really just immersing yourself in the experience. No kidding, and I feel like it’s perhaps because the fact that its a delayed live that there’s more of an incentive to have more of these little things – to make these events feel that much closer to the real thing. The amount of work people like Team ONIBE and the local “live admins” (as I like to call them, haha) put in, combined with the passion of the crowd really makes these DVs special. It really does; and it goes to show to how awesome a lot of the fans of the franchise are — whether the more prominent ones like the guys who are part of ONIBE, the ones who you call “live admins” who organize stuff like banner signings and what not, to almost any fan you could come across in one of these. To tell you guys a story real quick — back for Hakodate Unit Carnival I went brought along with me the same lightsticks I used for second live; which were four pen-sized utility lightsticks like the ones you’d clip on bags for hiking and stuff (lol). I was about to bust ’em out but after seeing literally everyone around me with their Kingblades (concert-grade light sticks) I rescinded the thought and resolved to just go through the live without one (I did order one prior to the DV but it didn’t make it in time). Right as the live started though my seatmate to my left went and tapped my shoulder and asked if I wanted to borrow one of his Kingblades. To which I answered “Are you sure? ?” but my face was probably like “Heck yeah!” (xD). They are (well, most of ’em… but let’s not go there xD) and I do believe DVs are also a nice way to introduce non-fans to the franchise as well. With that in mind, and given everything that we’ve said thus far, is a DV experience something you would recommend even to someone not really familiar with Love Live! (or whatever franchise that happens to have one)? Ah. Yeah…haha.. And I’d say so, with maybe some reservations. They’re probably not so great as introductions to the series but I’d say that DVs are an awesome way of getting further into franchises like Love Live. For all the reasons we’ve already mentioned, the experience of it all really is unforgettable. How about for you Leap? I think it’d be worth it for the spectacle of it all generally. At times I do try to detach myself from the event to imagine what it must look like for someone not privy to what’s happening. A crowd of people in silent agreement to suspend their disbelief for a couple of hours to immerse themselves fully for something that has already passed. Even to sate your curiosity as to what that would look or even feel like I think is a unique experience that you won’t see anywhere else. I think I got all my DV gushing out so that’s about all for me, Haha! Thanks for having me on Leap, it was fun! Aye, likewise, thanks for your time Carriage! Delayed Viewings (to me at least) have always been a very interesting phenomenon to observe with regard to its nature as a medium, and I’ve been wanting to write about ’em ever since I first saw one myself. Thankfully I hadn’t until now, as I wouldn’t have had the pleasure of getting to chat with Carriage about this very topic otherwise (go follow her content if you haven’t yet!). My thanks of course to Carriage again as well for really just agreeing to this little back and forth that we had 😀 I had a lot of fun, and I was glad to have been able to just sit down and talk with ya (well, kinda… the setup for this was weird I know, I’m sorry xD). I do plan to do more of these in the future so if you ever feel like you’re up for some Idol Chit-Chat, that is to say if you have a potential topic in mind of or relating to idols in some way that we could talk about, then by all means drop me a line either on Twitter (@Leap250) or with my e-mail form at the ‘Contacts’ tab up top (lol). I’d like to point out too that I reached out to Carriage and Al (for the first Idol Chit-Chat) with a subject already in mind so yeah, if you’re reading this, chances are I might also ask you to do one of these with me at some point, Haha! Have you guys been to a DV before? What are your thoughts about ’em? If you haven’t yet, what do you think about DVs now after having read our discussion on ’em? Let me and Carriage know in the comments section below! This entry was posted in Idol Chit-Chat and tagged aqours, concerts, delayed viewings, idols, love live sunshine, meta by Leap250. Bookmark the permalink. But yeah, DVs sound really fun! 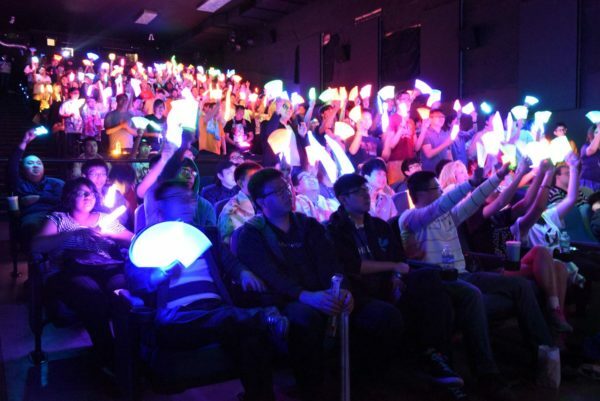 I think another reason why the atmosphere like you mentioned is so incredible to be in is the fact that foreign fans seem to have the same amount of love, passion and knowledge of the Love Live franchise as much as people who actually go to the venues in Japan. 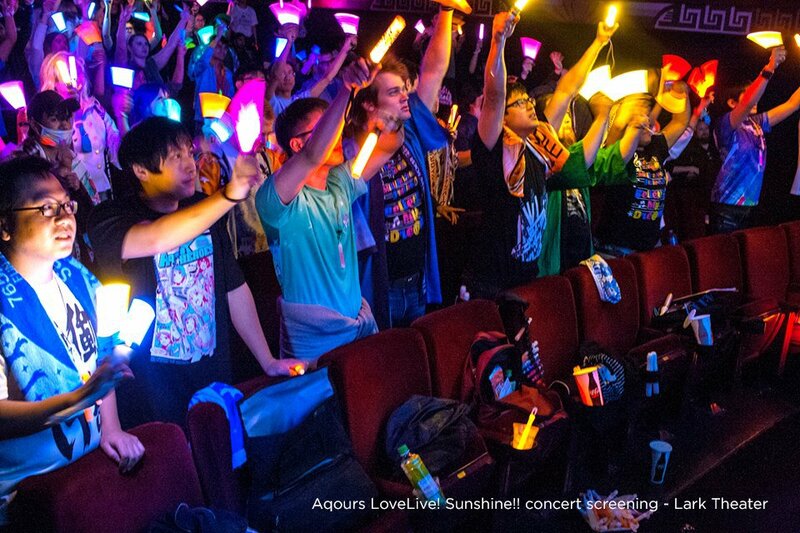 The whole penlight gestures, singing along with songs word for word, wearing merch of their favorite LL characters, cosplaying, the “ita-bag” collecting thing; I would assume it’s the same kind of environment as if you were going to a live in Japan. Plus, you can definitely see that LL has had a gigantic impact not only in the mainland, but the rest of the world. They really are. And yeah, it’s definitely a good show of passion from overseas fans — even more so at times when you think of how you know for a fact that most people are decked out in stuff they had to get *outside* of the country and that some of ’em sing along to the songs without really knowing the language all that well. This is the first time I’ve heard of a DV. The concept sounds interesting, and to be honest I don’t know how it would feel like even by imagining it. But it sounds from both your conversation that DVs would be a great experience to watch with other fans / non-fans and get to meet people that way – Certainly beats sitting in front of a laptop with an opened YT video XD.